Spring of 1977: Porsche fans are shaken to the core when the brand comes out with its new top model, the 928. The car defies—and exceeds—all expectations. “You cannot discover new lands without consenting to lose sight of the shore for a very long time,” said André Gide, French writer and 1947 winner of the Nobel Prize in Literature. Although Gide could not have known it, his quote beautifully captures the mood at Porsche in the early 1970s. What was going on in Zuffenhausen? The Porsche and Piëch families had just withdrawn from the company. In the United States, Porsche’s biggest market at the time, legislators were discussing new crash-protection regulations. And the Porsche 911 was seen as obsolescent due to the stricter emissions and safety regulations on the horizon. The winds of change were in the air, and a few individuals at Porsche started to tackle these changes in a comprehensive manner. Ernst Fuhrmann, the new chairman of the executive board, favored a novel model concept—a radical renunciation of the rear-engine principle. He envisioned a sports car with the engine mounted in the front and the transmission in the rear, connected by something called a “fast shaft.” This distribution of the drive system components is known as a transaxle construction, and it was to be a defining feature of the Porsche 928. The decision was daring, given Porsche’s tradition of rear-mounted engines, but “everyone was on board” when it was made, recalls Wolfhelm Gorissen, who directed the Porsche 928 project. 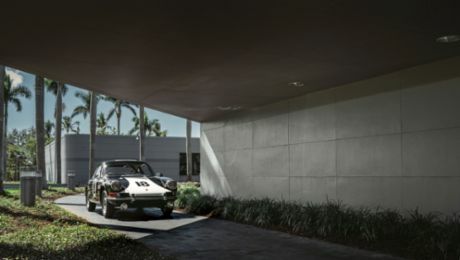 Development started in February of 1972, and the engineers at the Weissach Development Center broke new ground in every way. The engine, derived from a water-cooled, 4.5-liter V8 racing assembly made of aluminum, became the first to appear in a European standard production car. The engineers gave the chassis a completely new passive-steering, rear-wheel suspension: the “Weissach axle.” The car body was a combination of steel, aluminum, and plastic. And the polyurethane bumpers—yet another absolute novelty—were completely integrated into the body. They easily passed the newly introduced impact (pendulum) tests, which didn’t allow dents at impact speeds of up to 8 kmh. Bumpers hardly seem radical today but, at the time, they brought the engineers, designers, and of course project director Gorissen to the brink of despair. It wasn’t just a matter of their complex, elastic mount. In particular, the paint job presented a challenge. “At that time, we simply didn’t have a paint that could cover steel, aluminum, and polyurethane equally well,” Gorissen recalls. “There were different shades wherever you looked.” The right paint for the job had yet to be invented—and it was, just in time for the series production. The 928 was something different right from the start. Above all, it was positioned higher on the market—as a sporty touring car, or Porsche’s first Gran Turismo. The new car had four seats, although the two rear ones were not designed for long rides. It also felt extraordinarily spacious and had a capacious trunk. The car was considered large at the time, although it seems incredibly compact by today’s standards. “No other V8 sports car is so flat and elegant,” said Harm Lagaaij, Porsche’s head of design from 1989 to 2004. And he planned to drive “at least three 928s” in his free time. The 928’s world debut at the Geneva Motor Show in March of 1977 was a sensation, and the public was thrilled. According to Der Spiegel, “Former Volkswagen head Rudolf Leiding bought one at once—for his wife.” The magazine also noted, “No other car has played a more crucial role in Porsche’s highs and lows than the 928.” In other words, this completely new, incredibly modern, and timelessly elegant sports car clearly had everything it needed to take on the legacy of the 911. But events turned out differently, as we now know, forty years on, even though the Porsche 928 was the European “Car of the Year” in 1978—the first and only sports car to have received that honor—and even though it was continuously improved and upgraded. Its output increased from an initial 240 to 350 hp in the final evolutionary stage of the series (the 928 GTS built in 1991). Production of the 928 finally stopped in 1995, after a total of 61,056 vehicles had been built. The fifty-one-year-old from Connecticut is the proud owner of the first Porsche 928 ever built. Eleven 928s, starting with chassis no. 9288100011, made their world debut at the 1977 Geneva Motor Show. Born in 1940, Clausecker became a suspension expert and joined the 928 development team shortly before the car’s premiere. He was involved in testing winter tires—and in making the only factory race car of this model type. After studying design and automotive body construction in Hamburg, Kasten promptly joined Porsche in 1970 at the age of twenty-three. He worked on the 928 from the start, first as an interior designer, then on the exterior and as an assistant to studio director Wolfgang Möbius.